Diy on an old friend. I started messing with this instrument, when my primary violin suffered a major crack, last spring. During the visit to my luthier I eventually decided to go for a new instrument, and everything was good at the end, but one thing kept me stressed : In case of any future repair, I did not have a serious back up ready to be played, or a secondary instrument to carry for less important playing, jamming and outdoor events. 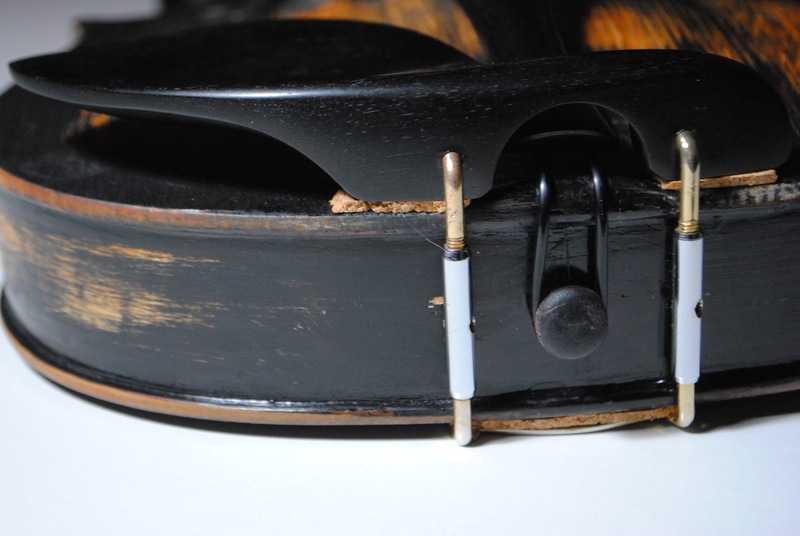 So I decided to go diy with an old cheap violin of mine, which has its own little story. But now, after I have used better violins, there were many things that disturbed my in this instrument (such as its painted fingerboard). My luthier advised me against any improvement on this instrument, (since most tasks would exceed its value) and suggested that I keep it for my experiments, since he noticed that I enjoyed it. 2. Well. there was no purfling. Or it was, but painted. Right. PAINTED PURFLING. I hate it when factories and companies treat people like folks that would never understand. 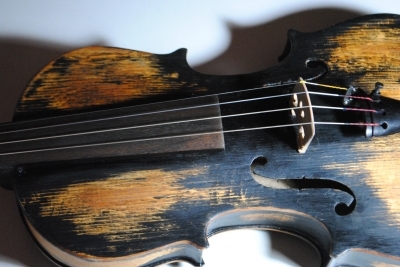 I don't expect every 100 usd instrument to have an inlaid purfling, but why bother paint one? 3. Removal of this crappy substance many factories "treat" their fingerboards. You know, this annoying thing that turns your fingertips black and sticky if you play that much. It's even more annoying when you try to remove it with sandpaper, and try to avoid to change the scoop and radius of your fingerboard. 6. New bridge. That was tricky, I carved many and while there was an improvement, I wasn't super happy. I did this again tonight, and I hope it sounds better. We'll find out next morning. 7. New tailpiece. Got to thank my luthier, who in the past advised me of keeping an afterlength no less than 1/6th of the original vibrating string length, especially in the A, D and G.
8. New chinrest. I was at a local multi store the other day, and saw 3 large sheets of 3mm cork on offer. Couldn't resist. What's left: fitting the pegs better ( I have to borrow a peg reamer) and fix this end pin, which in one day decided to go loose. 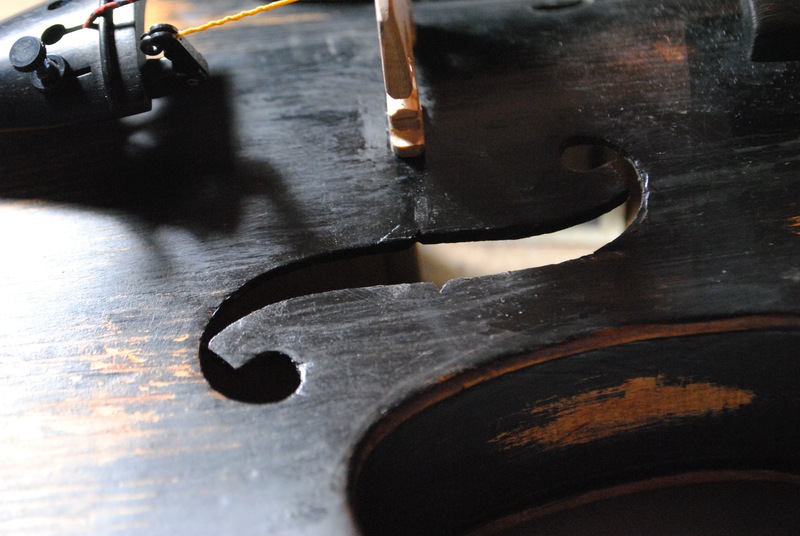 It's being held temporarily in place with the help of a little silk thread. But I don't think it's a good practice for a long time. Glad to hear that with a little bit of diy, care, love and attention you've given new-life to your old friend !!!! the only problem is that once you step this way, you never stop, you always think of something that has to be modified. At least that's what crosses my mind. And that's how I usually get lost. It think it is pretty cool... I think the word some use is "badass"..... love it..
Are you comfy with the sound? 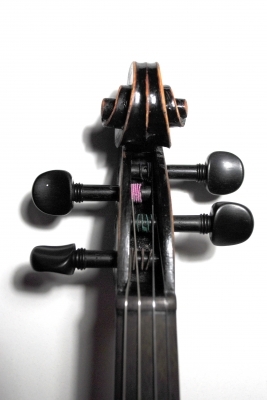 I hope you enjoy this cool looking sassy violin. 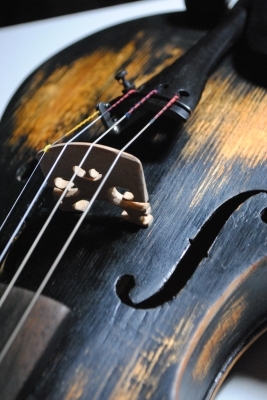 Having played this violin for so long in the past, I am comfortable with its sound. However, it's not that great or something really special to play on. I like it!! That black varnish removed only in some places looks, like was mentioned earlier, totally badass! I really like the "patina" it has. Then again I like the look of worn old violins compared to shiny new ones. That one is a bit towards the hollywood side, but it works. It looks great. Has a really presence of its own now. I can imagine it stands out a bit.